Perfect for adding natural structure to the face, Sculpt One is a luxuriously dense fan brush that allows for foolproof sculpting and contouring. With pressure, the velvety bristles splay out across the skin to blend and soften bronzers, highlighters, and finishing powders. “I wanted a fan brush that not only looks and feels good but performs well. The dense hakutotsuho goat bristles allow the brush to splay out while staying thick and soft.” — Sonia G.
Apply bronzers and highlighters along the curves of the face with a sweeping motion. Use soft buffing motions to blend and diffuse lines. Brilliant quality, gorgeous glimmering lacquer finish, excellent bristle design. Wonderful for bronzer and pressed finishing powders. 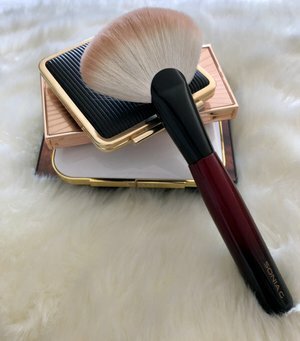 This brush halved my bronzer application time for cheekbones and facial perimeter because of its varied surface area, bristle shape, and pickup efficiency. For pigmented products, merely tap it in, then apply with a wiggle to diffuse. I don’t ‘load’ this brush - I tap, apply, tap, apply. Takes me 6 seconds to bronze my entire face, including cheekbone zone when ‘contouring’ with bronzer (not sculpting). To apply bronzer just under/on cheekbones, I pick up product on an outer third of the arc on one surface only. Apply with one tip pointing towards the nose, the apex of the arch (highest point) tilted towards the top of the ear, and the surface nearly flat on the skin. Sweep towards the ear first, then go back and wiggle/diffuse briefly. For facial perimeter bronzing, I very lightly tap/roll the tips of an entire (flatter) side onto product, apply with the same motion near the hairline, then wiggle inwards to diffuse. Any left over bronzer in the brush works for the jaw in a swift back-and-forth movement along the jaw edge. If you have less pigmented products needing heavier application, this brush is a great solution as it has the capacity to pick up an immense amount of product with little effort. Efficient indeed. This brush is lovely for pressed finishing powders, as it has wide (whole arch, flat side), broad (top of the bristle tips at arch apex), and smallish surfaces (end of the arcs) to play with. I have average cheekbone space and couldn’t figure out a technique to apply blush, highlighter, or true sculpting powder with the level of precision I prefer. Sonia G’s Face Two and Sculpt 3 do those jobs more effectively for me. Sculpt One bristles are slightly softer feeling on the skin than my Chikuhodo T-1 saihoko powder brush, yet have the strength (without pokeyness) to maintain the arc during application. They also have the right amount of flex to facilitate diffusion without being floppy. The standout element is the shape. Imagine a banana shape. The spread of the bristle tips is broadest at the centre, gradually narrowing in profile and thickness towards the ends of the arc. The airiness remains constant throughout. The overall length of Sculpt One works well, especially for facial perimeter. 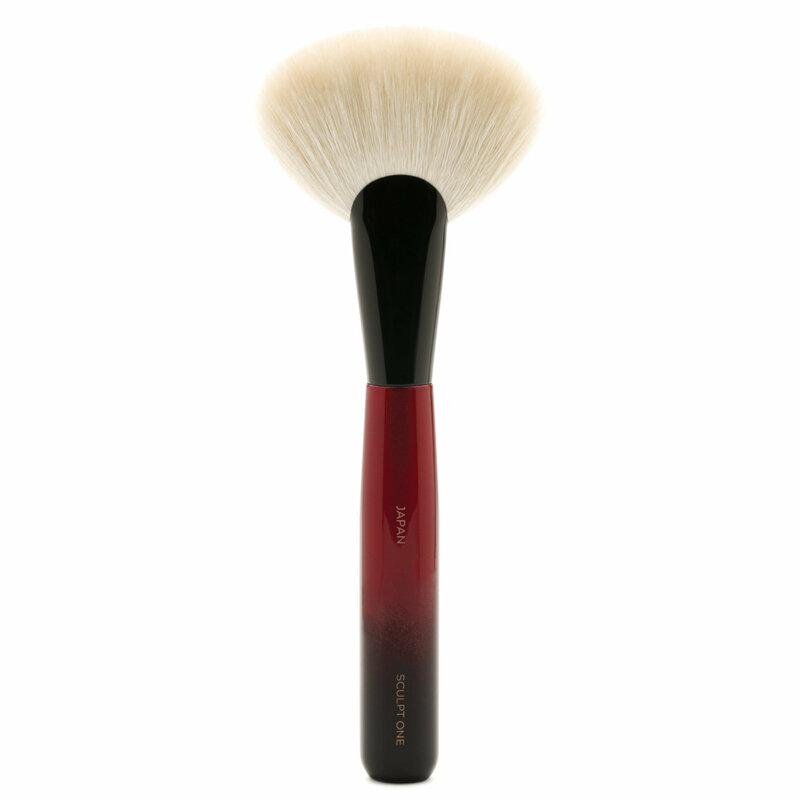 When contouring my cheeks, I hold the brush closer to the ferrule for greater control, so find the handle a bit chunky. I’d enjoy the somewhat thinner handle of Face Two on this brush, for sure. After washing, Sculpt One becomes airier/slightly broader, which enhances the diffusion effect. I didn’t use a brush guard and it retains its shape. There were a couple (literally) of wayward goat hairs that may benefit from a fan brush guard while drying if you’re fussy about perfect looking brushes. It didn’t affect application. No hair fallout whatsoever. Can’t see myself going back to other brushes for everyday bronzer application... Sculpt One is a speed demon! Add to your cart now and purchase. I went back and forth about whether or not to buy this brush. 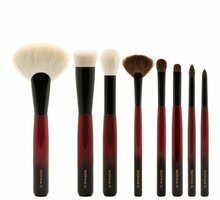 I have Wayne Goss brushes which I love but I wanted a larger one to cover a larger surface area. I justified this brush because it is very unique. It’s large and versatile. I can apply contour and bronzer, highlight, and blend out any thing g that needs it. This brush is soft, full but has give to be able to blend flawlessly. This is a dangerous purchase because this quality sets the bar so high, that now I need all of the brushes in the line! Highly recommend. *A tip for washing, after you wash and squeeze out excess water put a teeny bit of 100% aloe Vera on the outside of the bristles. Hang upside down in the brush guard to dry. Once it’s dry rub on your hand to smooth out the bristles and your brush will be conditioned soft and beautiful! This brush is a game changer! If you want just the right amount of bronzer at the right place you should definitively buy this amazing brush von Sonia G! Love,love,love!!! And the customer service at beautylish is amazing! This is a fantastic brush, and so versatile. I have several Fude brushes, and this brush compares to some of my most exquisite brushes. I can say that for the price this is an amzing value. The quality is exceptional, and it is beautiful. The hairs are not to dense, but not to airy either, just perfect for bronzer and contour, I like that is does not deposit contour with a line of demarcation, that many other contour brushes tend to do. Since purchasing this brush it is the only one I reach for bronzer and contour. 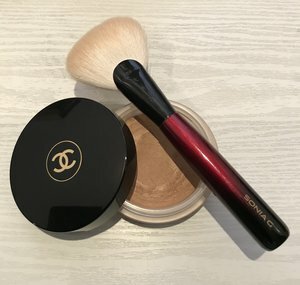 A MUST-HAVE FROM SONIA G.
This brush is perfect for applying my Soleil Tan De Chanel cream bronzer! The brush’s head fits perfectly into the pan’s opening. It gives a targeted but diffused application of bronzer. Just dip the brush directly into the pan, apply it precisely along the hairline, hollows of the cheeks and jawline then buff out for a diffused and natural finish. There are times in my life when I make a purchase that disrupts my technique, application, and routines so profoundly that it causes me to have a spiritual shift. I take my tools whether it is in the kitchen or on the ski slopes extremely seriously. With that being said, I cannot say enough good things about the Sculpt One. This brush is a break thru for me. It blends stiff products like a dream and it gives me a sense of control when I am contouring because of how Sonia constructed this brush. The pinched ferrel and the density of the bristles is what makes it so different then my other brushes. I am no longer a victim of my own messy contour. This brush is absolutely gorgeous. It's one of the most plush, luxurious brushes I own- actually, it probably is the most luxurious brush I own. It's simply superb. The only downside to it- and it's a big one- is after a few months of using it I noticed that it started losing a hair or two every time I used it (and that would be every day because this brush is so fantastic). I really don't know if it's me or the brush. I treat it with the same reverence I do all of my other Japanese brushes and don't have the same shedding problem with them, so I wonder if maybe I got a bad batch? But then again, maybe it is me and not the brush, I just can't figure out what exactly I could have done to it to make it shed when my other brushes don't. At any rate, it's got thousands of bristles and I don't think it's going to start getting thin any time soon, so I'm sure I have years of use left, but I am disappointed that a 75 dollar brush is so sheddy. It's so perfect in every other way though, I won't lie, I'll probably order another one when this one becomes unusable. Where has this been all of my life? 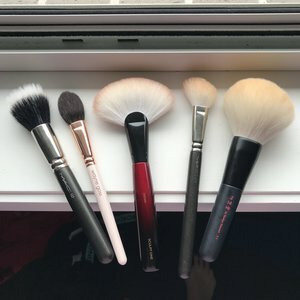 This is such a unique brush- and it’s excellent for bronzer application. So soft but quite thick- I was devoted to my Tom Ford Bronzer Brush but this is much easier. It’s like it “sculpts” to the contours of my face. You can use it for contour without having that dreaded stripe of color. It blends effortlessly. Highly recommend. 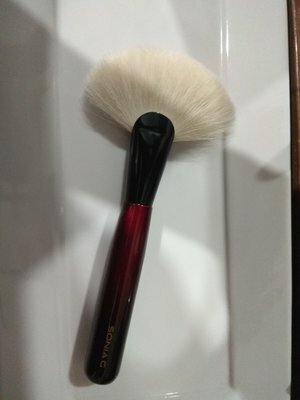 I have four Sonia G brushes (and plan to get more) and this is the one that I truly couldn’t live without. This is hands down the best contour brush I own, and I own plenty. I pair it with MUFE's face powder which has a soft texture. I was a bit concerned at first that the goat hair with such large surface area would lead to too dramatic an application, but this brush really excels. It applies the powder extremely well with no streaks or patchiness. I lightly tap this brush in the face powder, usually on one side, and then I start from my ear. I go back and forth a bit with the brush and it blends perfectly. No sharp line (not the look I'm going for), nice perfect shadow shading. I tried to use my other contour brushes from Hakuhodo, chikuhodo, MAC and MUFE, some of which used to be my favorites, but now I always go back to this one. Only a person with much knowledge about Japanese brushes can create this marvel. Luxury and softness Thanks Sonia for designing them !!! They are incredible, I only buy two to try them and now I want them all. It is an investment you will not regret. The Beautilish service is impeccable.